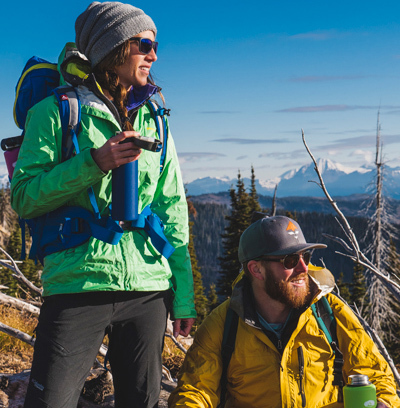 There's nothing more rewarding or refreshing than fresh coffee in the backcountry. Now, with the Gourmet PourOver Java Set, you can unlock all of the flavor and aroma of your favorite coffee no matter where you find yourself. This set includes the Collapsible JavaDrip pour-over camp coffee maker that pops up to a #4 drip cone and folds down to a 1- inch high. Features a snap-on storage cover and durable, nylon mesh, re-usable filter. The JavaMill ceramic, adjustable conical burr grinder makes fresh, custom-tailored grind. Spoon makes it easy to portion, stir and add sugar. CAUTION: Not for use with vessels with openings smaller than 2.5 dia. (wide-mouth water bottles and larger only). Not for stovetop or microwave use. Brewed coffee and grounds may be very hot. Handle with care. Keep out of reach of children and pets. Always respect hot liquids.